Featuring films by Zora Neale Hurston, Alice Guy Blache, Lule Warrenton and more. What if women were recognized for their contributions to motion pictures from the beginning of cinema? What if Alice Guy-Blache had been recognized as the first person, woman or otherwise, to direct narrative films and run a film studio? What if? Women have had a very long history with directing motion pictures, including Alice Guy-Blache, Lois Weber, Cleo Madison, Lule Warrenton and so many more. 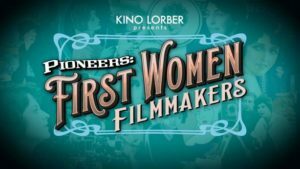 Kino Lorber’s Pioneers: First Women Filmmakers series shines a new light on the bountiful and courageous contributions of these first women filmmakers. A collection of short films from pioneering women filmmakers Alice Guy Blache, Lois Weber and more, HER DEFIANCE illustrates the cinematic power of women taking a stand. These films, all directed by women before 1920, show women standing on their own in all their fierce and powerful glory. These women are strong, independent and most of all defiant. With scholar Shelley Stamp and curator Sarah Flores in conversation following the screening. Featuring films by Zora Neale Hurston, Alice Guy Blache, Lule Warrenton and more. Childhood is explored through women’s lens with stories of mischief, empathy, determination and triumph. With Shelley Stamp and UCLA Scholar Kris Jones in conversation following the screening.